In every worldwide poll made to find out the best cities to live in, Vancouver always lands near or at the top. And why not – its weather is perfect, the people are courteous, the pace is less hectic, and most of all, there is so much activity and so many places to visit. Imagine having a rainforest in the midst of a cosmopolitan landscape – that’s the 400-acre Stanley Park. Millions of tourists and locals flock here each year for outdoor activities, sightseeing, or a simple break from the hustle and bustle of the city. Stanley Park has over 27 kilometers of forest trails waiting to be explored. It is also home to the Vancouver Aquarium, the largest public aquarium in Canada. 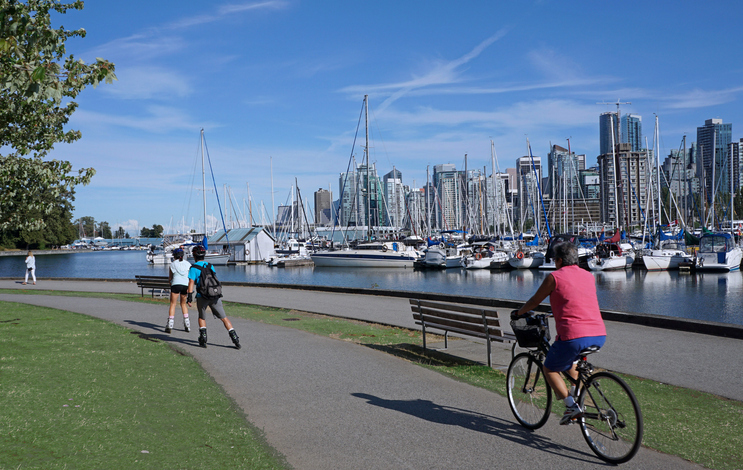 The park’s famous seawall is where you can make a pit stop in between biking or sightseeing to savor social media-worthy views of the English Bay. The historic First Nation totem display at Brockton Point serves as a testament to the great people who fist inhabited the area. The art and culture scene also thrives here along with the diverse habitats in the area. Watch concerts or cultural shows at the Malkin Bowl or get stunning paintings by local artists within the park grounds. Get to see more than 50,000 aquatic animals and appreciate the value of marine conservation in the largest public aquarium in Canada. Located in the middle of Stanley Park, this aquatic museum and marine research facility works in line with Vancouver’s thrust to observe environmental sustainability. With the help of professional trainers, get up close with animals like the otters and sea lions. Most of all, understand why it’s important to conserve marine species through the facility’s educational shows and exhibits. The Vancouver Aquarium is open from 10 AM to 5 PM all days of the year. For more information, visit their website here. Have a thrilling adventure in the alpine playground of Grouse Mountain. This 4,100-foot mountain is open all-year-round for outdoor activities. Ride high into the sky on a cable car for breathtaking views of the mountain, zoom across mountain peaks on a zipline, see and admire the protected flora and fauna, and more! Its high icy peaks during winter also makes it ideal for snow activities like skiing, ice skating, and sleigh rides. This must-visit destination is open daily from 9 AM to 10 PM. You can visit their website to learn more. Experience Chinese culture and history in the Dr. Sun Yat-Sen Classical Chinese Garden in Vancouver’s Chinatown. Modeled after a Ming Dynasty scholar’s home, this was the first Chinese garden built outside China. Exotic plants and trees set in a picturesque landscape of pagodas, paths, vistas, and bridges make this place worth a visit. Contact education@vancouverchinesegarden.com to make a booking for groups of 10 or more. You can also visit their website for more information. With so many trendy bars in the area, it is no wonder than Yaletown is Vancouver’s premier late night destination. At Hamilton Street, you can party ‘til you drop at Bar None Nightclub or enjoy drinks and have memorable conversations with friends at Hello Goodbye. Going over to Granville Street will take you to The Roxy, a popular venue for live music and good drinks. You also won’t want to miss the trendy Opus Bar in Davie Street – a celebrity hotspot located in the iconic Opus Hotel. If you are thinking of buying a home in the lovely city of Vancouver, I would be happy to help! I’m Don, your real estate specialist in the British Columbia area. You can call me at 604-817-7738 or send me an email at botsoldmunro@gmail.com.